One of the five medieval Quarters of Sutton was named “Maney and the Wylde”. Most of the houses in this quarter were gathered in the hamlet of Maney, centred on a village green where the “Old Smithy” now stands, and extending up the Driffold towards the old Manor House. Maney was an ancient settlement, dating from before the Norman Conquest, and it had an open field system, the fields being located on the relatively fertile ground lying between Wyndley and Wylde Green Road. There were meadows in the valley below Coles Lane. The land south of Wylde Green Road was first ploughed in the twelfth century and became the property of Wylde Green Farm, the farm and its associated cottages were at the top of Wylde Green Road. In the Middle Ages the whole area of what is now Boldmere was a vast expanse of open common land. Each of the Quarters had two tithingmen who reported to the Court Leet - for example, at the court of April sixteenth 1582 “Raphaell Smythe & Humfrey Moseley tithingmen of Maney and Wilde present that William left a fallen tree, blocking the Queens road in Coles Lane to the annoyance of the Queen’s subjects. They present that William Kynge senior and Roger Underhill let their hedges grow across the Queen’s road at Wilde Grene causing an obstruction to the Queen’s subjects who pass along the same road. They present that Simon Asheford permitted three of his pigs to go both unringed and unyoked against ordinance of the court, and they have nothing further to present.” So Maney and the Wylde had had a fairly quiet six months. It is hard to know exactly where the boundary of the Quarter ran - the best source of information is the Corporation Rental, written out every year, the earliest surviving one is for 1742. This lists the Manor House under Maney and the Wylde, so probably the boundary was the E Brook just to the north, and the brook may have bounded the quarter all the way to Erdington, except that Penns is listed under a different heading. Sutton Park was in Great Sutton Quarter, so when parts of the park were taken in as farmland in the sixteenth century (where Monmouth Drive is now) there must have been some discussion as to which quarter the farms belonged to; the seventeenth century Hearth Tax records, however, where houses in each quarter are listed, includes the farms in Maney and the Wylde. The map shows the wide extent of common land known as the Coldfield, where Boldmere is now. 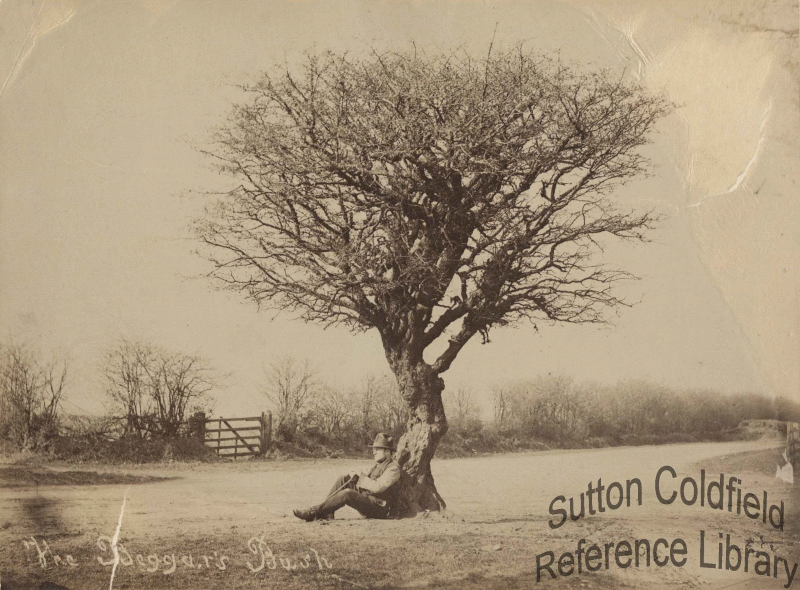 The curved northern edge of the common was once the boundary of Sutton Park; the common once extended almost as far as Birmingham Road, but over the centuries parts of this edge of the common were turned into farmer’s fields. Chester Road crosses the common, a turnpike road at the time of the map under the Stonall, Stonebridge and Castle Bromwich Turnpike Trust; the mile markers give the distance from Stonebridge. In the Middle Ages the occupant of the house at the end of Green Lanes received an annual fee for escorting travellers over this dangerous stretch of road - the “Bowbearer’s Fee” was still being paid in 1800. 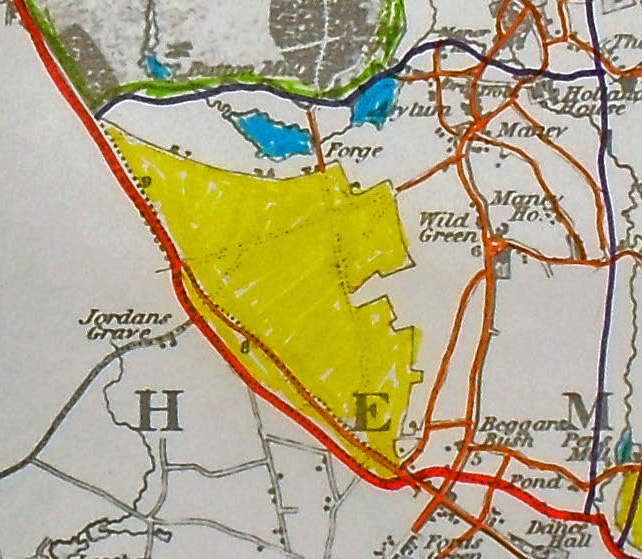 Maney and the Wylde Quarter; the base map is part of Greenwood’s 1822 map of Warwickshire, “HEM” is the start of “Hemlingford Hundred”, the Beggars Bush is wrongly labelled (it should be just north of “Jordans Grave”), and the Coldfield Common is coloured yellow.